The leaves and flowering tops are antispasmodic, aromatic, carminative, digestive, galactogogue, stomachic and tonic. They are taken internally in the treatment of feverish illnesses (especially colds and influenza), poor digestion, nausea, abdominal cramps, gastro-enteritis, migraine, insomnia, depression and exhaustion. Externally, they are used to treat acne, loss of smell, insect stings, snake bites and skin infections. The mucilaginous seed is given in infusion in the treatment of gonorrhoea, dysentery and chronic diarrhoea. It is said to remove film and opacity from the eyes. The root is used in the treatment of bowel complaints in children. Extracts from the plant are bactericidal and are also effective against internal parasites. In Chinese medicine it is used for kidney disease and gum ulcers, in Indian medicine for earache, rheumatoid arthritis, anorexia, itching, menstrual disorders, and malaria. 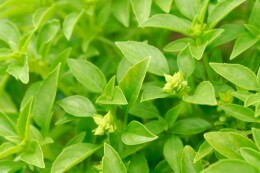 Known Hazards: Basil contains estragole a potentially carcinogenic and mutagenic essential oil. Do not take during pregnancy or give basil oil to small infants/children.